Kiefel, a member of the Brückner Group, has launched a new thermoforming system, SharpFormer, and the supporting software KID-CAT for production of refrigerators. “We have made a quantum leap with the SharpFormer,” reported the division leader responsible, Andreas Frisch. The name Sharp stands for Speed (24s cycle time), High efficiency (machine availability of over 95%), Accurate (precise reproducibility), Reliable (dependable machine concept) and Pressure forming (perfect contours), according to the company. Due to its modular construction, system delivery time for the SharpFormer is said to be reduced to four months instead of seven. As introduced, it is now possible to freely select the production direction from left to right and visa versa without influencing the delivery time. With its compact dimensions, the system also fits into smaller halls. 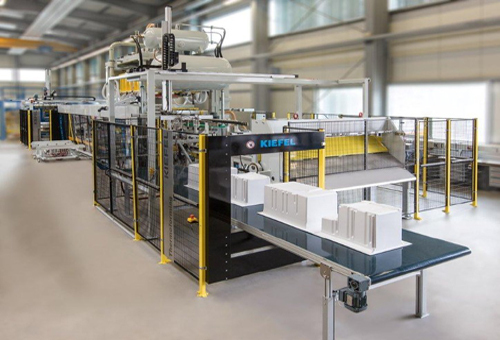 “Due to the faster cycle time of just 24 seconds, in other words 150 refrigerator inner liners produced per hour, the customer also generates greater revenues in the same time,” added Murat Derin, Project Manager at Kiefel. A range of tools are used for production of the thermoformed refrigerator inner liners, for example, black ceramic radiators, which are impact resistant, durable and separately controllable. In the tool interface area, Kiefel has developed a new flexible system, which reportedly facilitates interface adaptation of 90% of the tools found on the market within a fast set-up time. A new KID-CAT software is also available on the operating panel. “This guides the operator on a step-by-step basis through the creation of a new recipe and delivers time savings of up to 85%”, stated Stefan Wimmer, Key Account Manager at Kiefel. This unique software is supported by video clips, which visualize the thermoforming process for the operator.